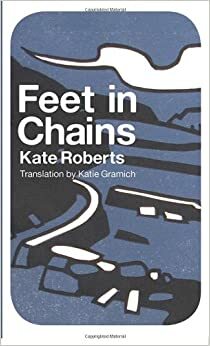 The book of our August meeting was a Welsh classic – Feet in Chains by Kate Roberts. The novel was originally published in Welsh under the title Traed Mewn Cyffion, but we read it in English translation. The book group agreed that although the musicality of the Welsh language isn’t carried over, the newest translation of the novel by Katie Gramich is the best one so far. The book is set in North Wales and spans the period of about forty years from 1880 into the First World War and because it covers such a long period of time, it gives an excellent portrayal of life in Caernarfonshire at the turn of the twentieth century. The theme of the novel is the hardship of the slate mining community, but unlike other industrial novels from this period, such as Cwmardy or Black Parade, Roberts’ book focuses more on the impact of the terrible economic working conditions on an individual family rather than the whole village. Moreover, because the novel spans such a long period of time, we’re not only shown the harsh realities of life at the time, but we are also constantly reminded of what things could or used to be like. There is no single most important event in the book around which the narrative revolves; you might think a particular even will be important as you’re reading, but you’re always proven wrong. In my opinion, what makes the novel particularly bleak isn’t the hard life in the quarries and the widespread poverty, but the conflicts and back-biting within one’s own family; unlike other novels written during this period, the domestic sphere in this book doesn’t provide the safety that is traditionally associated with it. The book group also agreed that the excellent portrayal of the relationships within the Gruffudd family had to do with Kate Roberts’ being a short story writer. The individual chapters of the novel are often little vignettes and stories in themselves. Roberts is particularly good at choosing touching stories which drive a point across. An example of this is a scene in which little Owen wins money in his Sunday school competition and as he’s coming home he’s expecting his mother to be proud of him and be happy that he wants to buy book for his money rather than sweets. However, when he gets home, his mother takes his money away from him because the family needs it and even delivers a clip round the ear when he starts sulking. When his older sister Elin hears him crying, she comes to comfort him, but it is that night that Owen becomes aware of the poverty his family is living in. By giving an example of a concrete impact on an individual, Roberts is able to show the effects of poverty in a way that is more palpable than showing a large-scale impact on the whole community.